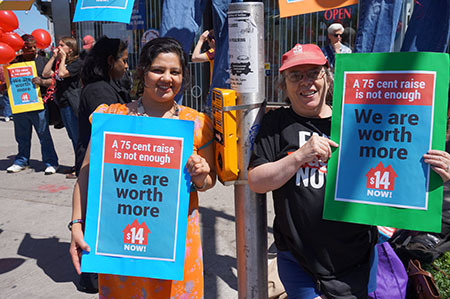 On May 31st the Campaign to Raise the Minimum Wage rallied volunteers and allies, including members of the Workers’ Action Centre, to do an outreach blitz at Dufferin and Bloor to spread the news about the minimum wage rising from $10.25 to $11/hour after 4 years! While we are happy that this raise was a result of the year long organizing efforts of all of those involved in the campaign, $11 still leaves workers 16% below the poverty line. We will continue to send the message of $14 to all the party leaders and politicians who are asking for our votes on June 12th. As the June 12th election approaches, help send a message to all 3 party leaders urging them to support a $14 minimum wage for all workers. Click here to send an email. We got a lot of media attention! 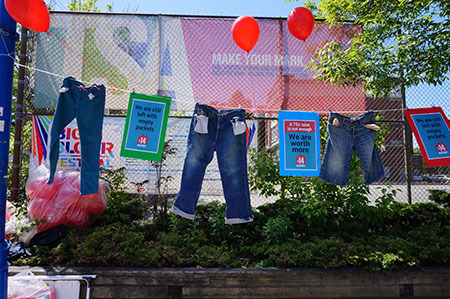 We got petitions signed, we had a clothes line with messages hanging that a 75 cent raise is not enough, workers are worth more, and jeans hanging with pockets pulled out symbolizing that $11 still leaves us with empty pockets! The clothes line caught a lot of attention from people passing by. 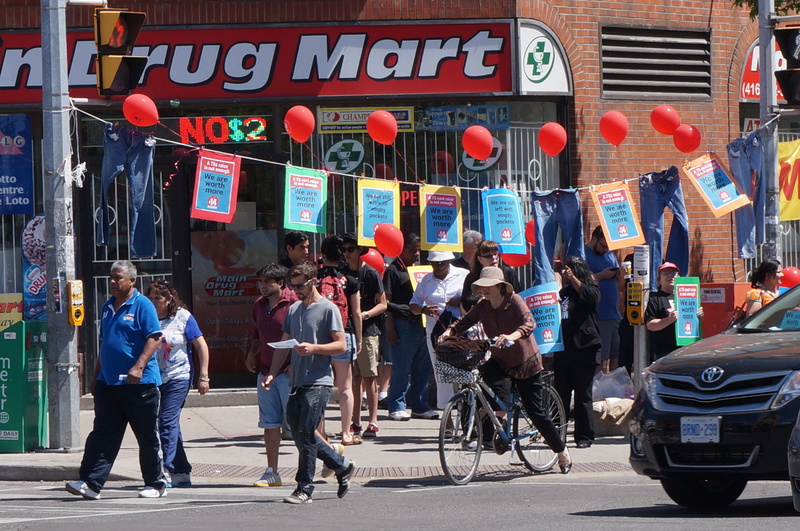 The outreach blitz was held at the intersection of Dufferin and Bloor in Toronto. WAC members posing for a picture. Thanks for all the hard work WAC members! WAC member talking to CBC about how difficult it has been raising her son on a minimum wage that leaves so many living in poverty. WAC members displaying messages that $11 is not enough! A long shot of one of the four street corners where we set up our outreach. We got petitions signed in support of a $14 minimum wage. Many agree that $11 is not enough! Are we going to keep up the fight? Yes!!! 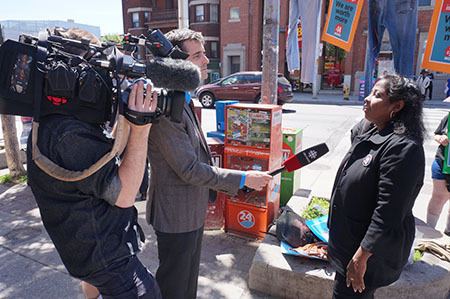 Check out all the outreach actions that happened across Ontario and the media coverage we got here!